A little Photoshop tutorial after some time. Selection techniques (or rather their deployment) is one of the most difficult aspects of photo editing. 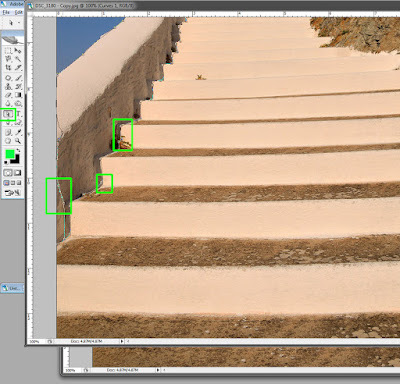 In an earlier article we'd talked about some of those techniques in connection with selecting hair or foliage, but today I'll show you how to use the path tools of Photoshop to select larger, block-type areas with great precision. At this point you might wonder why should you not just use the magic wand, the magnetic lasso, or the freehand lasso tool to do the job. The answer is simple: because those tools don't give you the ability to fine-tune the selection the way the path tool does. Even the magnetic lasso tool isn't perfect at finding edges, and that is especially the case if what you're trying to select might be a well-defined object, but not a well-defined image. It's easier to see this with a photographic example. 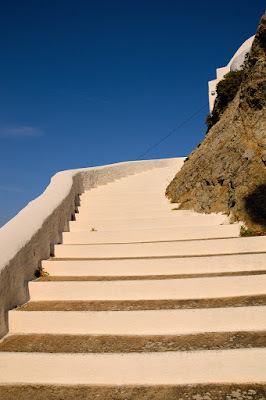 In the photo above, let's assume you want to make an adjustment to the side wall, in the left side of the stairs. It's a well-defined object, with a more-or-less sharp differentiation from the stairs. 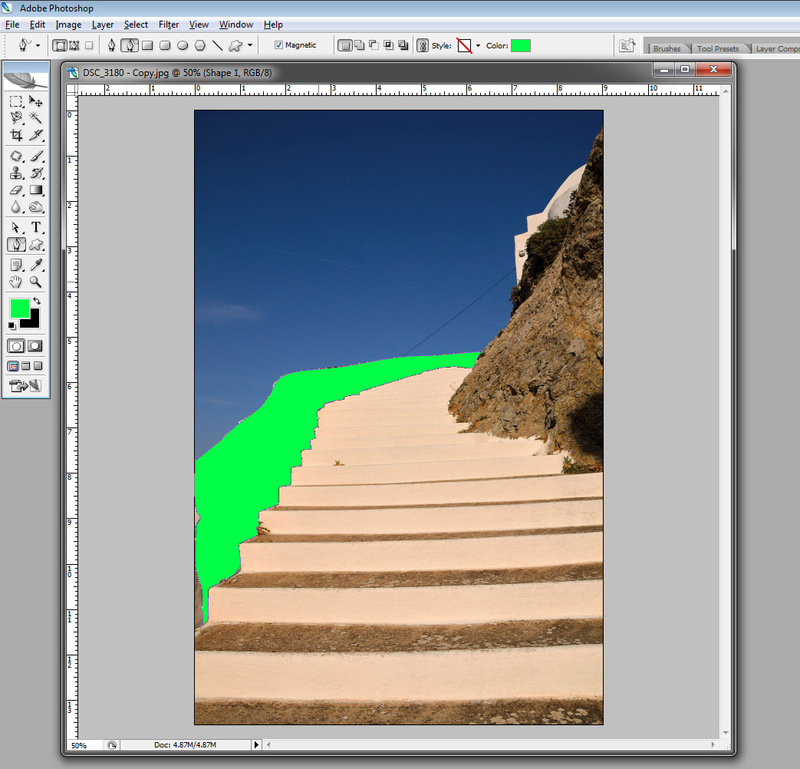 However, if you tried to use the magnetic lasso tool you'd discover that Photoshop is fooled by the shadow and, as a result, selects part of the stairs with it. This is not acceptable. The path tool to the rescue! At this point you will need to add a layer that will contain the adjustment you'll need to perform. 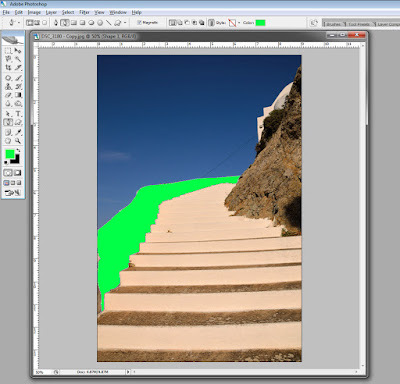 For the purposes of this tutorial, I'll add a curves adjustment layer but of course it can be anything you want. After you add the adjustment layer, delete its mask from the Layers tab and then click on the chain icon of the shape layer below it. This will unlink its own mask, which you can then drag and drop onto the adjustment layer above. You can now delete the shape layer (it's only a solid color layer, and as it is obvious we only need the mask/path we created). Adjust the shape of the path so that it fits your requirements. In this example, I'll make sure the selection is on the side wall itself and not on its shadow. It's a good idea to do that at a great magnification. 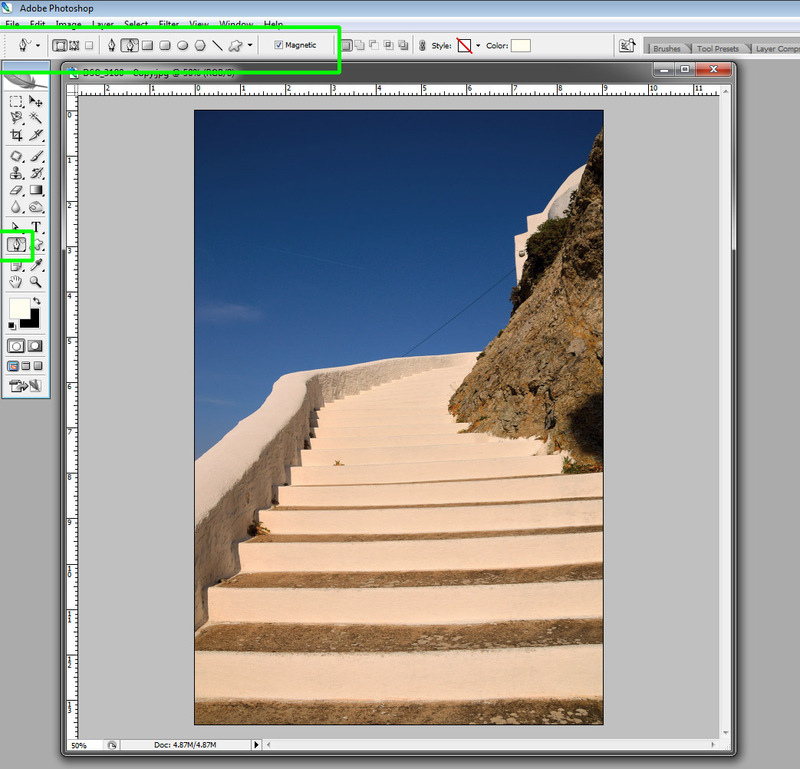 If needed, you can also add anchor points using the path tool. 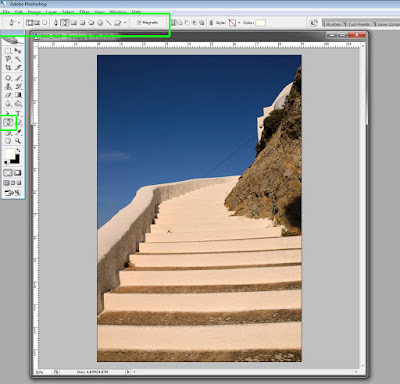 After you're satisfied with the selection, you can perform the adjustment on the adjustment layer. In this case, I decided to slightly adjust the hue by dragging the blue curve a bit downward. Note that you can still make changes to the path, and as you drag the anchor points around you will see the changes "live" - in other words and in this example, we could see the hue changes applied to the areas we select.